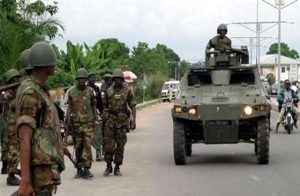 Angry youths in Gadumo community, Lokoja, Kogi State, have attacked a yet-to-be identified soldier for allegedly making overtures to a married woman in the community. Punch correspondent gathered that the incident happened on Tuesday close to the Master Energy Filling Station in Gadumo. A witness said the soldier came from Lagos and was fond of making amorous advances to village girls. He said the soldier made overtures to a married woman, who turned down his request, saying she was married. The state Police Public Relations Officer, Mr. Williams Aya, said the incident had yet to be reported to the command. He, however, said the Divisional Police Officer in charge of C Division visited the community and was told that the soldier had been taken away by the army.